Finally stepping off this week's emotional roller coaster, as everyone here in Boston went from great Patriots Day expectations to the Boston Marathon bombing, the factory explosion outside Waco, the Senate vote on background checks, multiple earthquakes in Asia, and back to Watertown's meticulous manhunt. Locals mused that Friday night would see the greatest bar tab in city history as a release from sequestering themselves indoors all day. Most people expressed relief over joy; it's nerve-wracking keeping yourself "alert" for 24+ hours. Baseball self-consciously took a lower profile after Monday, given its hand-in-glove relationship with the marathon. My favorite part of every Patriots Day is the mid-morning Fenway game, timed to end so 30,000+ energized fans can spill out into nearby Kenmore Square and join the confluence of humanity motivating runners to gut out the marathon's last agonizing miles. Boston's horsehide-and-sneaker combo is a sweet spot for the city and when I think about Patriots Days past and future, the link feels (and should remain) inseparable. 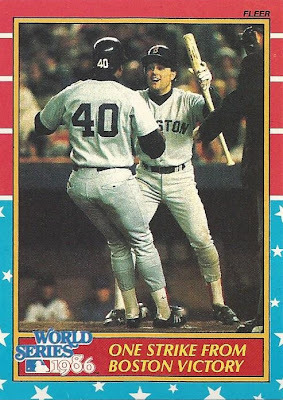 I pulled some of my favorite Red Sox cards with that connection in mind. 1938 Boston Marathon: 1936 winner and then-leader Ellison "Tarzan" Brown surprises fans by taking a cooling swim in Lake Cochituate mid-race, ceding his chance at victory. 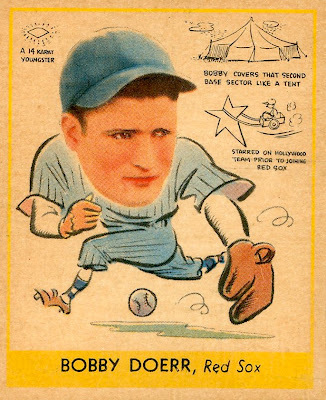 Brown returned to win in 1939 and became the first Boston runner to break 2:30. Both guys on this card started 1986 with Seattle, far from World Series prospects, but a mid-August trade made them teammates with the same Roger Clemens who'd struck out 20 Mariners in April. Spike contributed a .875 postseason OPS and Henderson homered twice in the World Series, including a long blast off Dwight Gooden. 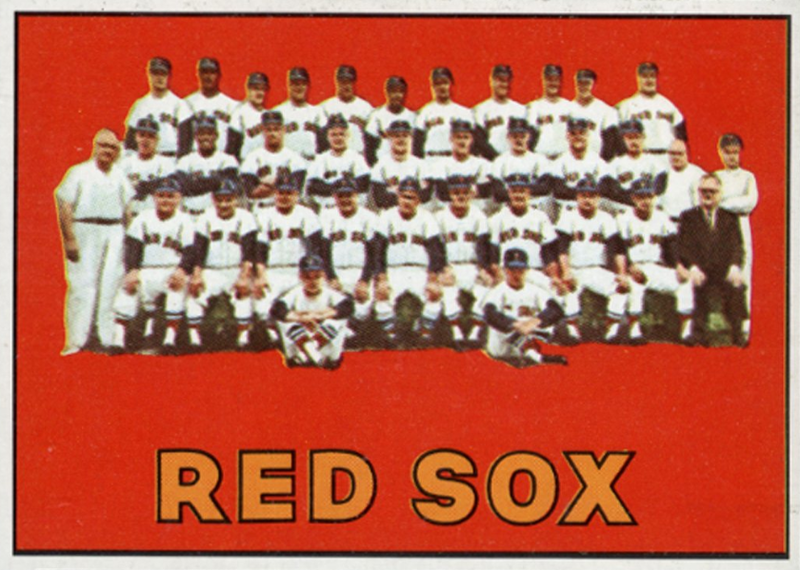 Boston's Bruce Hurst went 3-0 that postseason, including a complete game 5 win over Gooden, who lost twice in the series. Hurst continued to pitch well for years, but if Boston wins that series, Bruce would still be on billboards around town. 1987 Boston Marathon: Two-time Japanese Olympian Toshihiko Seko wins his second Boston title, following 1986 wins in London and Chicago. As he put it, "The marathon is my only girlfriend. I give her everything I have." Donruss printed several postcard-sized sets in the 80s, adding hand-painted legends like Williams to this 60-card collection of Champions (active players) and Grand Champions (retired players). I enjoyed the new-and-old variety as a young collector and still own all of them (set checklist). 1984 Boston Marathon: Briton (and Olympian) Geoff Smith wins his first of back-to-back races, the last Boston Marathons to offer no prize money. Adding a financial incentive quickly inflated the pool of elite competitors, which also increased the race's international prestige. 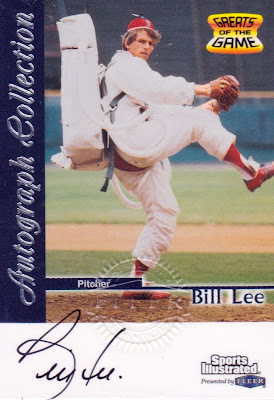 Baseball spent the 1970s being as eccentric as Spaceman Lee. They belonged together. 1970s Boston Marathon: Bill Rodgers wins four times, twice setting a course record. 1982 marked the last time a Commonwealth resident (Alberto Salazar) won Boston and 1983 was the last time an American (Greg Meyer) did so. In 1975, Boston became the first major race to add a wheelchair division. 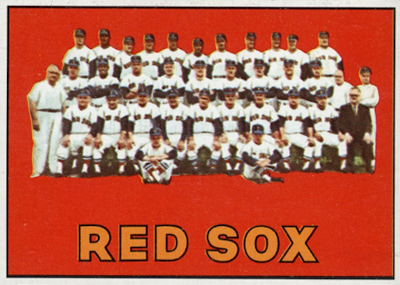 Boston's 1967 pennant-winners, decked out in red, red, and more red. 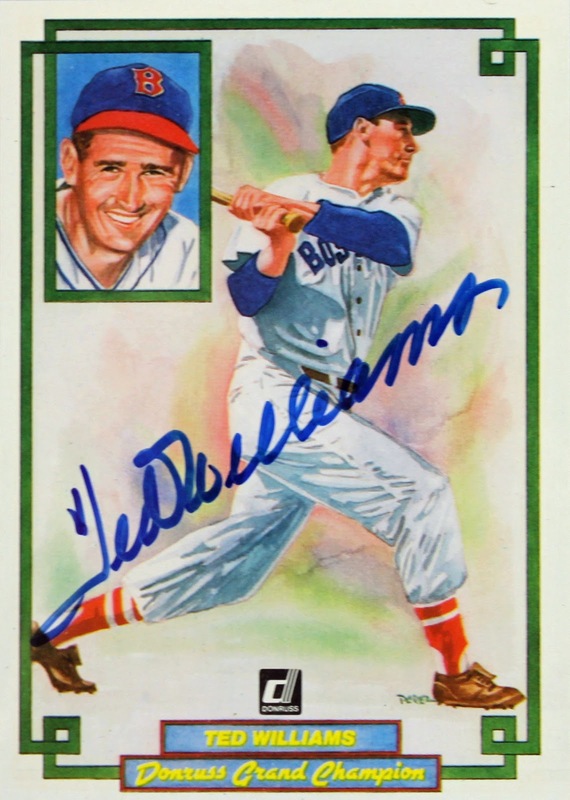 This is tough card to get, thanks it being a scarce Topps high number, the year of Yaz's Triple Crown, and dear to both team and World Series collectors. Thanks to everyone outside Boston for this week's shows of support and solidarity. Here's hoping the marathon and baseball remain linked now and forever.